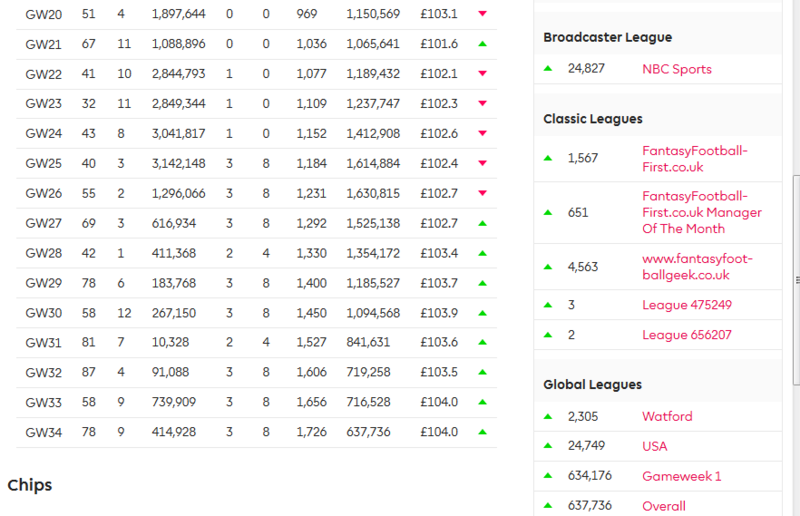 Having no Wild Card or Free Hit Chip, I have downplayed the last week or so, showing little interest in FPL. Not to mention the AFL kicked off the Premiership season in Australia, so my attention has been diverted. Maybe that’s a good thing, as I have not concerned myself with many happenings in in FPL or on Twitter, if it hasn’t been #FPLBeerClub related. I’d heard a few different pundits and fantasy managers discussing DGW strategy we start to consider our plans. To maximize point potential, the ideal plan would to have 15 players who all feature in Gameweek 34 (12 fixtures). Reason enough to hold that second Wild Card as this vital game week comes into focus. Coming off my best week (69 points) since Gameweek 20, there is little planning to do until the FA Cup 5th Round Replays next week. Using data compiled by Ben Crellin, fantasy managers are provided statistical analysis and probability of what teams will be without a fixture in Gameweek 31/35. As of this writing, there are just two confirmed matches; LIV vs WAT and STO vs EVE. The remaining teams and fixtures are yet to be determined. 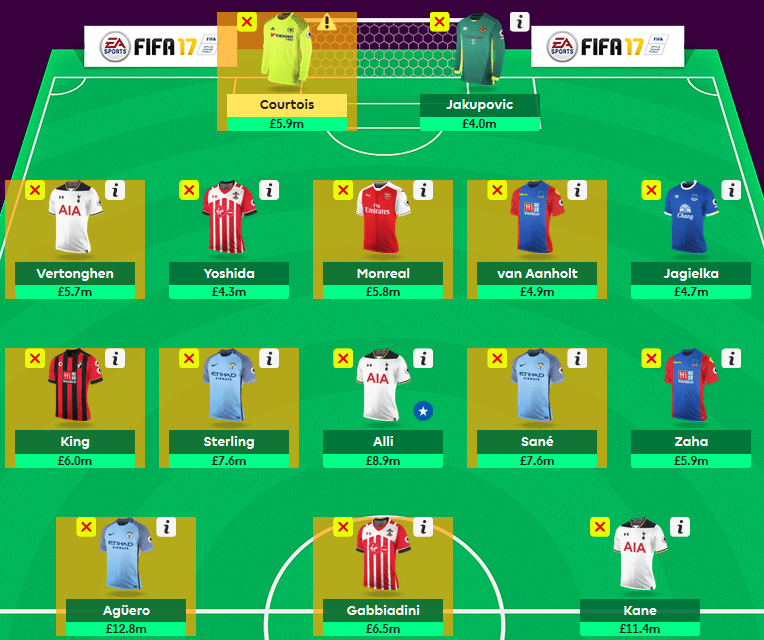 So what is a fantasy manager to do? How else do I sum up this first DGW, which I activated my Triple Captain Chip on Sergio Aguero? Disappointing…very disappointing. Much like my entire season, this single action reflects just how poorly my squad has played this season. While there have been some good decisions made, the frustration in seeing a player not perform has cost me more points and used up one of my most important chips. Add to that, the fact Pep decided to rest Raheem Sterling against Stoke, after chipping in with an assist days earlier versus Sunderland. Depending on what fantasy sites you call upon to help, one that I fancy on a regular basis, Fantasy Football Geek indicates I have the proper players in place. “The core players are then 8: Aguero, Lukaku, Sigurdsson, Sterling, Mane, Coleman, Brunt and Alonso. Starting to look like more of a template now which is understandable going into the blank and double weeks.” The only difference being that I dropped Alonso in favor of Mawson, since he was playing. So it appears I am in good company when it comes to being frustrated. Starting at the back, I missed Heaton being benched due to a late illness, which automatically slotted Jakupovic in as the starter at the conclusion of GW28. While he did get me a save bonus, it was nullified as Hull gave up 3 goals to Leicester. Moving forward, I still plan on sticking with this duo, as Jakupovic will start GW29, home to Swansea. In fact, I see 3-4 games in which Heaton will give way to Jakupovic based solely on match up. However two of those games are home matches and Burnley still plays very tough; Spurs in GW30 and Man U in GW34. Defensively it was a nightmare…again! Just 3 points from my starting 3 defenders; Brunt, Coleman and Mawson. The only bench option would have been Yoshida, but he returned just 1 point as well. Still waiting on the health of Friend, but Boro has been leaking goals, even at home and don’t expect him to be much of a factor. Mawson was introduced for Alonso in order to free up the budget to bring Aguero in. I figured Swansea had a good shot at a clean sheet and Mawson has scored in 2 out of his last 5 games, yet Swansea has only kept 3 CS on the season. For Mawson it’s about his offensive production. Brunt, Friend and Yoshida are on the short list to be moved. WBA has a nasty run of fixtures and I am looking to potentially double up on Everton, introducing Funes Mori with the next 2 matches at home against WBA and Hull City. Outside of the L’pool and Man U in GW30/GW31, Everton then face Leicester and Burnley at home. Four great home matches! At 4.8, I might keep Brunt just because he is an offensive threat, as a defender playing OOP as an attacking midfielder. I had planned on bringing Alonso back, but Chelsea hasn’t kept a CS in the last 5 games and Alonso had accounted for a single goal since GW21. The midfield has been my Achilles heel all season long. Seemingly I am always a week early or week late when shuffling players. There has been no consistency in my midfield play all season and its reflected in my overall score of just 1292 points and the fact I am still globally ranked at 1.5m. Not where I expected to be. My midfield has been settled for the past few weeks. Snodgrass, Mane and Sterling were brought in GW26 to couple with Eriksen, the longest tenured player since GW21 and Sigurdsson with Swansea now facing a favorable run. Out of GW27, Sterling will be the only player not to make the cut. The fact Pep will continue his rotation leaves Sterling as a risk, which will cost potential points. With the Spurs scoring 7 goals in the last 2 games Eriksen has picked up 13 points on 2 assists in GW27, his first points since GW21. He’s a catalyst for Spurs but his returns have me questioning his form but Spurs have a good schedule through the end of the season. Chances are with Spurs in form I will hold Eriksen through his spell. As much as I don’t want a Liverpool midfielder I will stick with Mane into GW29. He comes off 13 points (goal/assist) in the 3-1 win over Arsenal. One tough match in GW29 away to Man City and after that…L’pool have a nice run of games through GW35. Sigurdsson also appears to have good fixtures ahead after picking up his third assist in as many games. Just want to see more goals from him. Snodgrass is currently on the outside looking in as my 5th midfielder. I have transitioned back to a 3-4-3 with the in form Gabbiadini now starting as my third. I have been keeping an eye on Kamil Grosicki, since he made the move to Hull, I have been impressed with the Polish international, only problem is Hull doesn’t score much. That said, Grosicki has returned 2 assists in his last 2 games, along with a fair amount of dead ball responsibility. If I move for him it will be Snodgrass to make way. Up front I am still feeling the effect of picking up Gabbiadini in GW26 with a blank, followed by another 2 weeks later. Not a wise move on my part, still he did return in GW27, which keeps him as an in form forward headed into GW29. Due to the fact the Toffees had games the past 3 weeks I have been running with Lukaku, he secured his 6th goal in the past 3 games, in a 3-2 loss to Spurs. Two favorable home games against WBA and Hull means Lukaku will continue to see playing time. For GW30/GW31 it’s possible I will move him in favor of another as I don’t like the Liverpool and Man U match ups. As for my “man crush” he completely crushed me and the other mangers who brought him in and activated the Triple Captain Chip. It wasn’t bad to see him pull 21 points after the Sunderland game, hoping he would add a goal or two to that tally. It was the exact opposite. Man City was flat and played to a 0-0 draw against Stoke City. The plan had backfired, even though the run up to the DGW indicated it was a great situation and Kun could potentially “go Newcastle” on either opponent. It comes as no surprise he will not factor into my squad in the near future. I am planning on shipping him out by Friday in favor of Fernando Llorente, who will most likely get the captain’s armband against Hull. GW29 could be interesting depending on how Llorente plays as the following week Swansea visit Bournemouth. Harry Kane is on a very short list and most likely be brought in for GW29, depending on my budget. I don’t want to sacrifice Lukaku the next 2 weeks and want to hold Gabbiadini through GW32, after Spurs in GW28; Palace (H), Bournemouth (H) and WBA (A). Potentially a GREAT differential leaving Kane (TSB 20.4%) sidelined in favor of lesser owned TSB 8.8% Gabbiadini and 10.4% Llorente. Not sure I have balls of steel to make that decision or not. After Wenger’s decision to bench Sanchez in GW27 his spot in my starting XI is no longer guaranteed. Previously I mentioned the exclusion of Sanchez being my turning point in the season, one in which saw nothing but a string of red arrows. As the leading scorer, 187 points and at 11.5m, an uncertainty surrounds Alexis looking forward to GW29. Plans were to bring him in after the blanks game weeks, but that decision is now in doubt. Options to replace him; Hazard, 29 points in his last 4 games, Alli, 2 goals in his last 2 games or Pedro, 28 points in his last 3 games. 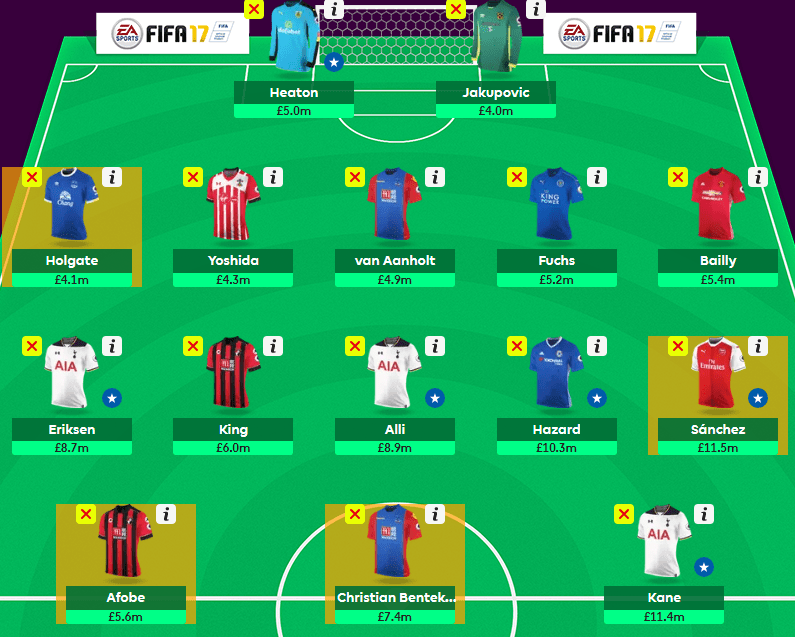 Bringing in Hazard hits my budget, but would still allow me to move for Kane, leaving 1.0m ITB. Introducing Alli means I would triple up on Spurs with Eriksen and Kane. A risky move, but any offensive points SHOULD belong to me, right? Pedro at 7.1m isn’t a guaranteed starter, worse he rarely seens a full 90 minutes, finishing full games just twice (GW18 and GW21). It’s Sunday and just finished watching an unimpressive display by Man City and their 2-0 victory over Sunderland. Can’t say I was all too pleased with the performances of Aguero and Sterling, both added this week for a -8 because of the City’s DGW. Thankfully both returned points, but City did not dominate as I had expected them too. Unlucky for Sunderland who hit the goal frame numerous times and had one called back for offside or the score could have been different. However I figured Pep would try to run the score up but that was not what City appeared to have in mind on the pitch. As for starting XI, I took an -8 point hit as indicated late Friday, after being persuaded to active the Triple Captain Chip on Aguero and his fixtures against Sunderland and Stoke City. Further discussion left in doubt the fitness, form or fixtures for future DGWs later in the year. Candidates to wear the TPC would be none other than Sanchez or Kane, but much can happen between GW27 and GW34, the next possible DGW. As it turns out, Sanchez didn’t start against Liverpool, which has many questioning Arsene Wenger’s decision to bench the Chilean. Not surprisingly Kane continues his blazing form with a brace against Everton, scoring 6 goals/1 assist in his last 4 games. I will look to be targeting him come GW29, most likely in place of Aguero. It’s not my intention to bring Costa back into the mix, with just 1 goal in his last 5 games. 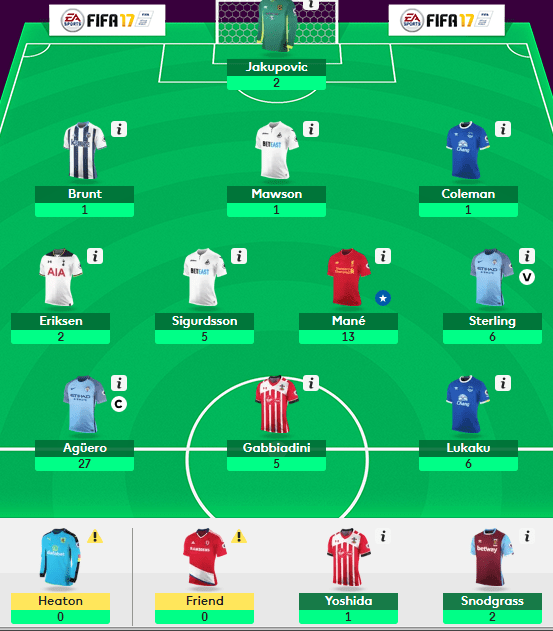 For GW26 I “wasted” my FT on Gabbiadini with So’ton on a blank game week, resulting in another -8 point hit to bring in Snodgrass and Mane to have a full starting XI. The move appears to be paying off, as Gabbiadini continues his great form with a late goal (and 5 points) against WHU to give him 4 goals in 3 EPL games since joining. Lukaku was primed to be the top forward for GW26 through GW28, as Everton had 3 games during that period with no blanks. He continues his form by finding the back of the net against Spurs, giving him 6 goals/2 assists in his last 4 games. However come GW30 I might be looking to ship Lukaku with the Toffees facing Liverpool and Man U away. Many managers should be looking forward to the next 2 home games as Lukaku face WBA and Hull City. I said hello again to my “man crush” Kun Aguero after transferring him back in, after an absence from my squad since GW10! With just 4 goals since that time, it was one of my better decision this EPL season. Aguero just happened to wear the armband and carry the triple captain chip this week against Sunderland and Stoke City. I had no intentions of running Aguero out this week, but was persuaded after listening to a few podcasts and reading threads on the “why” and “why not” for Aguero this weekend. Originally I had Sterling slated to be my captain and not take the hit for Aguero, but changed my mind. It’s a case of I would rather be with Aguero than without this week, just on the off chance he goes off for big points. 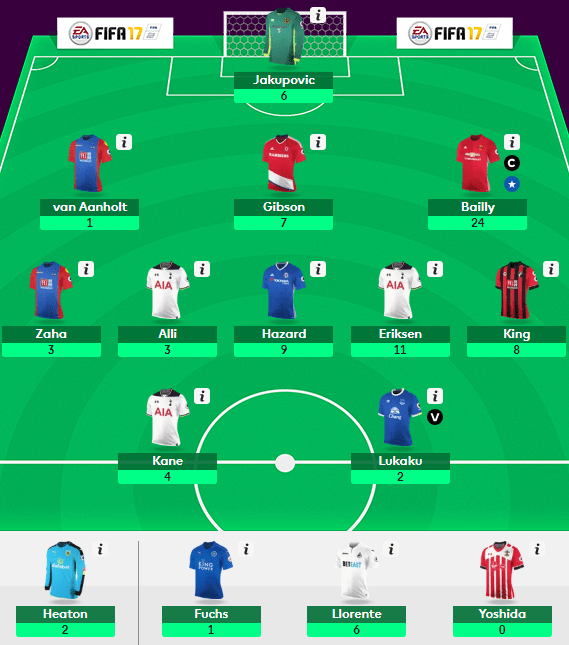 Can’t say a goal and 1 BPS is a great first of two games, but 21 points had boosted my weekly score to 61 points. His addition to my squad will be short lived, as I don’t plan on keeping him, opting for Kane come GW29. Outside of Eriksen (2 points) I was pleased with the play of my midfield players. Sterling continued in his fine form with the assist on Aguero’s goal, as well as a CS totaling 6 points. Much like Aguero though, I don’t plan on sticking with Man City players, so his departure is imminent after the DGW. Mane might make the grade, but at 9.3m I am not sure I want to stick with him. Outside of Man City in GW29, L’pool has a great run to the end of the season and Mane has been the midfielder in form. Even with the price tag I might stick it out for a few more weeks. He finished the week with 13 points on a goal, assist and CS with 3 BPS! That’s 3 goal/1 assist in the last 3 games. Sigurdsson has now returned in his last 7 of 8 games, 3 goals/5 assists and is still the key for Swansea. The schedule is kind with just Spurs and Man U still to come, he may stick around the rest of the season in my midfield. At 7.6m and his current form, he is worth the investment. Some thoughts of doubling up with Llorente up front for the short term as well. Defensively, I brought in Mawson this week for Alonso in order to support the addition of Aguero. Chelsea has not secured a CS in the last 5 weeks with their match against WHU on Monday and just a single goal in the last 7 weeks. Difficult to run without Chelsea assets, which I will look at after GW28. Mawson didn’t impress as Swansea couldn’t keep a clean sheet, which tells me he needs to score to be a strong differential. 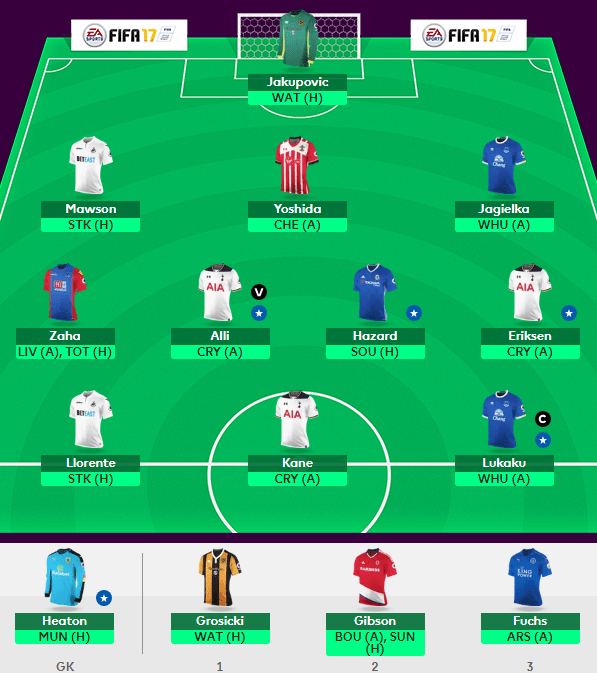 Brunt and Coleman were the other starters in my 3-4-3 and each were held to a single point. Brunt is going to be moved, if not for GW28, then GW29, as WBA has a difficult run of fixtures through GW34. Thankfully I didn’t double up on Everton defenders, as I had plans to pick up Funes Mori, but didn’t like the Spurs match, as the Toffees go down in defeat 3-2. With Hull and WBA in the next 2, I might double up on their defense as I look for 2 clean shhets before Livepool and Man U.
Oddly Heaton was left on the bench in favor the old man, Paul Robinson. Left me frustrated, but Jakupovic will be subbed in for this game week thus increasing my weekly total to 63 points on the back of 1 save point. I don’t favor Heaton next week against Liverpool and will run out Jakupovic against Swansea. As it stands now I have nobody in the Monday game, but am already seeing a green arrow for the week. I feel pretty confident I will end this ugly run of red arrows and climb in the global rankings. Hopefully this spawns a bit of a run for me, as I continue to struggle with form. 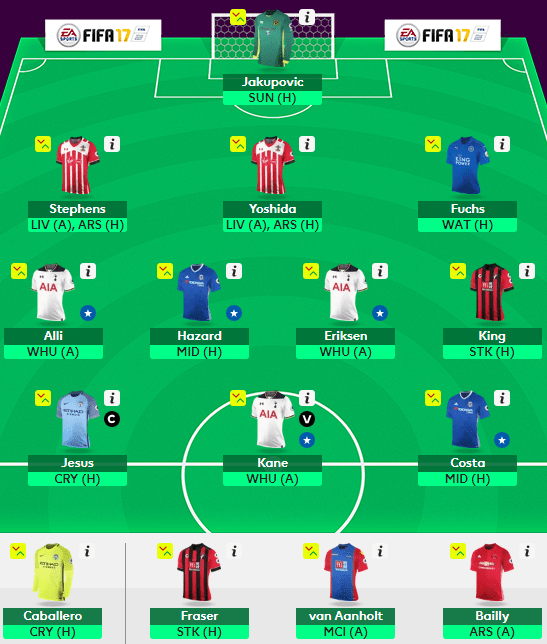 Looking ahead to GW28 it appears I will only run 10 starters out. As it stands now I have 8 starters, including Jakupovic, Coleman, Mawson and Brunt defensively. The midfield sees just Mane, Sigurdsson and Snodgrass to start, while up front it’s just Lukaku. The FT will be used for a midfielder. If not Sterling, then Eriksen in order to free up enough budget to bring in Kane and potentially Hazard to my starting XI, which would leave me with 0.3m ITB and 8.1m if I move Sterling the following week. Currently I have my eye on Pedro as well, through the Palace game in GW30. Not sure I want to double up in the Blues midfield, but it’s an option I can look forward to. Currently he’s pegged as the starter, but usually sees an exit before 90 minutes. After the exclusion of Sanchez from Wenger’s starting XI, I am having second thoughts about him. Talented and sensational are only two words to describe his play this season for the Gunners, but could be paving a way for his exit? A bit of doubt in my mind is a scary thing, which now has me looking in the direction of Hazard as a replacement for Mane in a few weeks. More dynamic than Costa, we know what Hazard can do. Third in points from the midfield, he has 6 double digit hauls this season but has only returned in 2 out of the last 4 games. Looking at hiss remaining fixtures only City and United look to be the formidable opponents in GW 31 and GW33. With two games remaining in GW27, we will see if any other questions are answered. Hopefully Kun and City come out to play against Stoke.